For use in petroleum, chemical and oil transfer, petrochemical vapour recovery, all loading arms in bottom loading operations, as well as tank truck delivery. Flexible and lightweight liquid transfer and bottom loading composite hose offer optimum chemical resistance to aggressive media. Composite hoses are available in a complete range of advanced films and fabrics to meet all hose requirements, with externally crimped dry seal fittings in diameters from 1″ to 10″. Uni-CHEM composite hose assemblies meet USCG 154.500; are manufactured in compliance with BS 5842 and are available with EN 13765 compliant construction. All Uni-CHEM hose styles are constructed to marine service specifications in accordance with US Coast Guard spec. 154.500 and I.M.O. regulations. Specifically designed for in-plant transfer operations as well as tank truck delivery and rail car loading. Constructed with multiple plies of polypropylene films and polyester vapour barriers. Rated for full vacuum. Uni-FLON Special Chemical Service hoses are constructed to meet the demands of highly aggressive chemicals.Special chemical resistance with PTFE inner liner, reinforced with multiple plies of polyester an polypropylene films. Rated for full vacuum. Ideal for transferring petroleum and aromatic products in production, refinery and distribution facilities. Suitable for all hose loading arms in bottom loading operations. Constructed with multiple plies of aromatic resistant films and fabrics. All hoses can be color coded to API color codes. Rated for full vacuum. Hoses are ideal for use with petroleum and petrochemical vapor recovery systems in ship to shore, bottom loading and tank truck applications. This hose is lightweight and flexible. Manufactured to meet specification CF33-154. Rated for full vacuum. Designed for the transfer of a wide range of petroleum products. Hoses are ideal for transfer of media from storage tanks and process piping to rail cars or tank trucks. Multiple plies of polypropylene films and fabrics are encased in a polyester vapor barrier for superior operation. Rated for full vacuum. Hoses are designed to handle modern gasoline additives such as MTBE, ethanol and 31% benzene.Hoses are built with an effective combination of polyamide, polyester and polypropylene film and fabrics to meet the demands of today’s additives. Also recommended for all JP aviation fuels. Rated for full vacuum. Designed as an upgraded version of Novaflex’s standard, except that it has a temperature rating of 147°C (295°F). The high temperature version has the same tube but the reinforcement elements are upgraded to polymides and nylons that have superior strength at elevated temperatures, permitting 250psi working pressure to be maintained. Rated for full vacuum. Specifically designed for the pump rental industry. 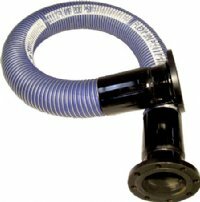 Rugged suction and discharge hose provides extreme flexibility, lightweight handling and excellent service life. Excellent for the transfer of water and oily water. Absorbs pump pulsations. Easy to package for shipping and storage. Manufactured for use in tanks with floating roof drain system.